As some of you may have noticed, that what Charlosa.com has been lacking of late is any actual reviews of any of the rums listed on the site. There’s been roundup’s of Rum Shows and Rum Clubs, as well as details on bottles and distilleries, but nothing that I would really call a proper review. It’s my own fault really, starting a website with plans of world dominance and delusions of grandeur, I set upon the mammoth task of adding every bottle all at once, be it Rum, Cachaça, Tequila or Vodka. I must have had too many of something when making that decision, as after all this time, there are still gaps that need to filled in, such as details on some of the distilleries, the History of Cachaça and basically every bottle review. Along with playing catch up with all of the missing content, there will be regular sneak-peaks and reports on both the Notting Hill and Kanaloa Rum Club’s, news about new or interesting rums, upcoming tastings and Rum Shows including my take on the day and of course the all important Rum Reviews. As well as tasting observations about sipping the rum in it’s neat form, each rum will also be tasted over ice, as well as making the base of four classic rum cocktails; Cuba Libre, Daiquiri, Mai Tai and Mojito. There may even be a fifth cocktail, inspired by the rum under review, but that will be determined on an individual basis. To round off each review, the rum will be given its rating on my very own non-scientific good to bad scale of; Rum Heaven, Sipping on the Beach, Great Mixer to Sip, Cocktail Mixer and No Comment. To start off the Rum Reviews, I will be looking at Appleton Estate V/X, the 8 Year Old Appleton Estate Reserve and the 12 Year Old Appleton Estate Extra rums. 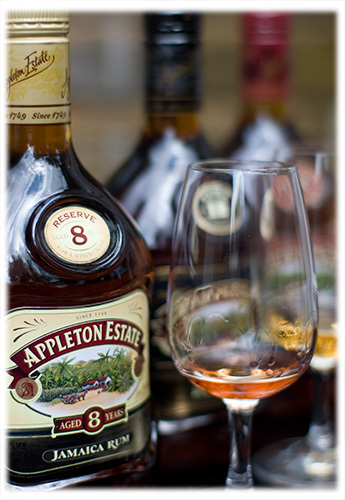 Why Appleton Estate? Well partly because I’ve thoroughly enjoyed finishing a bottle of the V/X recently with my usual Rum and Diet Coke’s, but also because of the generosity of the nice folk at Appleton Estate for sending me over a bottle of the Reserve and Extra rums for review. So lookout over the next couple of weeks for full reviews and hopefully a couple of Appleton Estate inspired cocktail recipes.